Fitness is just a hop, skip and a jump away with the Crossrope Get Lean Jump Rope Set. Jumping rope is one of the most intense cardiovascular activities you can add to your fitness routine. It gets your heart pumping in a matter of minutes, and it’s an effective workout even if you only have a few feet of space. 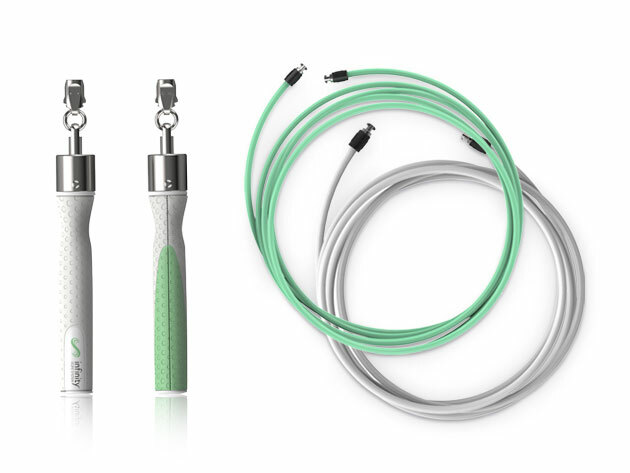 Plus, you can take a jump rope with you when you travel to stay fit on the go. The Crossrope Get Lean Jump Rope Set packs all of these benefits into a single, weighted rope for simple-yet-effective fitness. The Get Lean Set comes with interchangeable ropes that go from beginner-friendly light to advanced heavy ropes, and you can switch them out in a snap thanks to the built-in fast-clip system. Each rope’s coating eliminates tangling — you can use it on any surface without fraying or breaking, too. It’s easy to take with you on business trips or just fit in workouts throughout your busy day. The free custom training app includes fun workouts and challenges, so you’ll never get bored with your rope jumping routine. Normally the Crossrope Get Lean Jump Rope Set costs $88, but right now you can jump your way to fitness for only $67 (23% off).